FIRST, the positive. 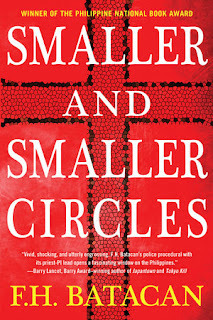 “Smaller and Smaller Circles” is that rare film based on an award-winning local novel in English. It’s about two Jesuit priests helping to solve a series of killings of pubescent boys in the dumpsite known as Payatas. Being a crime-thriller, it is such a welcome breather from the usual soaps and romcoms that proliferate today in local films and television. The film is definitely well produced. Even small roles are offered to name and fairly well known actors who appear only in one or a couple of scenes, like Christopher de Leon as an NBI director, Tessie Tomas as a TV host, Alex Medina as a false suspect, Bernard Palanca as the boyfriend one of the major characters, Gladys Reyes as a councilor, Mailes Canapi as a grieving mother, Cholo Barretto as a friend of the killer who reveals the reason how he became one, Dexter Doria as a carinderia owner, and many more. They’re all quite competent. The best is Ricky Davao as Cardinal Meneses, who is aiding and abetting the crimes of a depraved and corrupt Monsignor Ramirez (only mentioned, never seen), just like the cover ups the church did for perverted priests in the Oscar-winning “Spotlight”. The one who is really wasted here is TJ Trinidad as an NBI agent who didn’t get to do anything much of value. Technical aspects are generally good, notably JA Tadena’s aptly dark and atmospheric cinematography, and the musical score of Lutgardo Labad that imaginatively uses a children’s choir from Bohol. That said, here’s what we’re looking for in the film. First of all, tension, suspense and action. We’ve seen a lot of crime-thrillers and this one doesn’t escalate in a nerve-wracking manner that leads to a cathartic crescendo the way classic examples of the genre do, like “Silence of the Lambs”, “Citizen X”, or Hitchcock’s “Frenzy”. It tries to go into the mind of the serial killer with his own voice over narrations of how he feels and what torments him. This is okay in the novel, but becomes problematic on the big screen. Does the writers and director want us to sympathize with the murderer by making us acutely aware of his feelings and what he is going through? Later on, someone explains why the killer became that way. He was sexually molested several times by their P.E. teacher, an angle that seems inspired by lots of movies and docus on real life serial killers who were sexually abused as a child, like Albert de Salvo in “Boston Strangler”, Aileen Wuornos in “Monster” (which won an Oscar for Charlize Theron), Mary Bell in “The Story of a Child Killer”, Michael Bruce Ross in “The Roadside Strangler”. It also reminds us of Edward Norton as an altar boy abused by a member of the clergy that made him a killer in “Primal Fear”. But all those are American. In the Philippines, as one repulsive NBI character (Raffy Tejada) in “Smaller” points out: there are no serial killers. We read somewhere before that if sexual abuses in our country would turn victims into serial killers, then all the kids who were pushed by their own parents into being child prostitutes to service foreign pedophiles (especially in Laguna), would have mostly grown up to be psychos who get to commit sexually related crimes. For all we know, they might have grown up to become one, but since there are no concrete studies available on the matter, we can only make our own deductions, which is what the film (and the novel on which it is based) does. It posits that there might be serial killers here, but they are not exposed to the public due to the incompetence of our law enforcers who simply fail to solve crimes. So let us give in to the film’s conceit. Yes, we have a serial killer lurking in our own dumpsite and yes, instead of cops, it’s Jesuit priests doubling as forensics experts who are tasked to track him down after he mutilates his victims. To add an aura of sophistication to the whole enterprise, the priest who’s presented as the lead character, Nonie Buencamino as Fr. Gus Saenz, speaks fluent French after teaching in Paris. He converses in French with a former student, Carla Humphries as Joanna, who now works as a TV journalist. They’re also seen having a night at the opera to watch Mozart’s classic opera, “The Magic Flute”,which is ruined by a shamelessly meddlesome socialite who sides with the corrupt clergy, only to regret it later. But despite all these elements, our attention wanders and our interest wanes while watching the movie. Basically, it’s just too talky as they discuss procedurals and, with its lethargic pacing, offers less dynamic action. Nonie and his assistant, Sid Lucero as Fr. Jerome, are both fine in their respective roles. They’re projected as good, decent people who disdain the corruption they see in their own church, but still, we don’t really root for them totally. There is just no gripping climax that pushes you to the edge of your seat and, when one of them is accosted and assaulted by the killer, we tell him “buti nga” for being so dumb in agreeing to meet with a psychotic person all by his lonesome self without any protection, making all the cops who are with him all so dumb for letting himself do it all by his lonesome. Much more attention is given in making the film a social commentary attempting to expose serious socially relevant issues like the sordid wrongdoings of the clergy, the bureaucracy, and of the poor always bearing the brunt of all kinds of abuse and oppression. There’s just no sense of urgency or exciting build up leading to the big reveal of the killer’s identity. To begin with, they already keep on hinting about it in earlier scenes. The viewer would be so dense not to guess early on who the killer might be. As it is, the film appears more like a bomb with a very long fuse. When it finally explodes, it doesn’t give out a really deafening bang but sounds more like a muted fart.